My weekly exercise in gratitude, or as some of my blogging friends put it, three things that made me smile this week. This autumn has been freakishly warm—no chilly days and cold nights—and the leaves have not been as brilliant as they usually are this time of year. 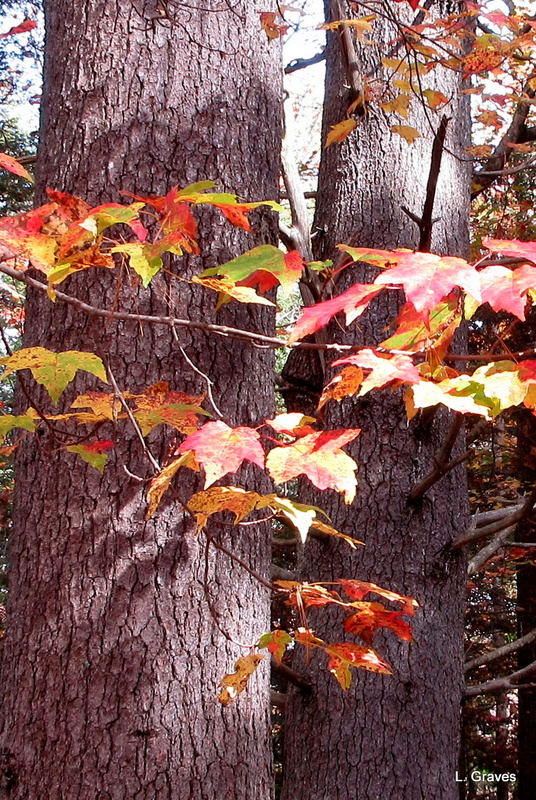 Nevertheless, fall is here, with its wonderful slant of light. While the days might not be crisp and invigorating, they are still cool enough for a morning bowl of oatmeal. 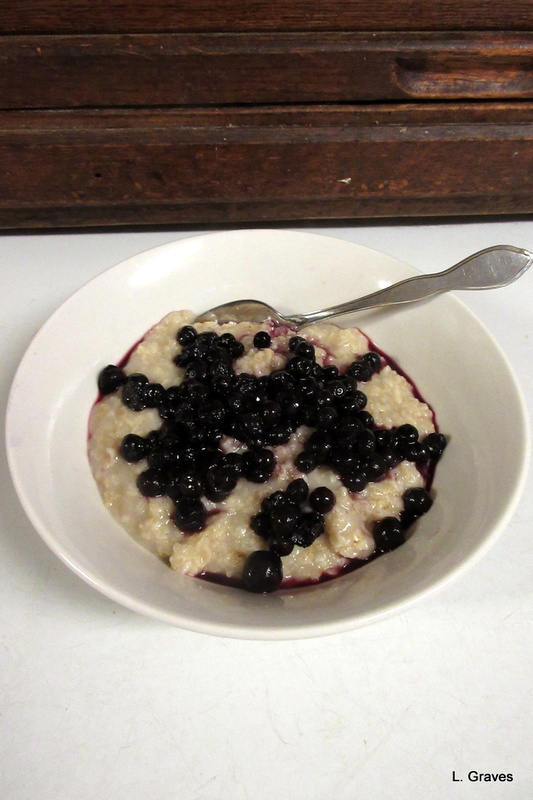 So, first: Oatmeal for breakfast with a generous serving of Maine blueberries, the sweetest of them all. Second, the autumn leaves. Although less brilliant than they usually are, the leaves still bring a burst of beauty and color to the landscape and, as pictured below, our backyard. 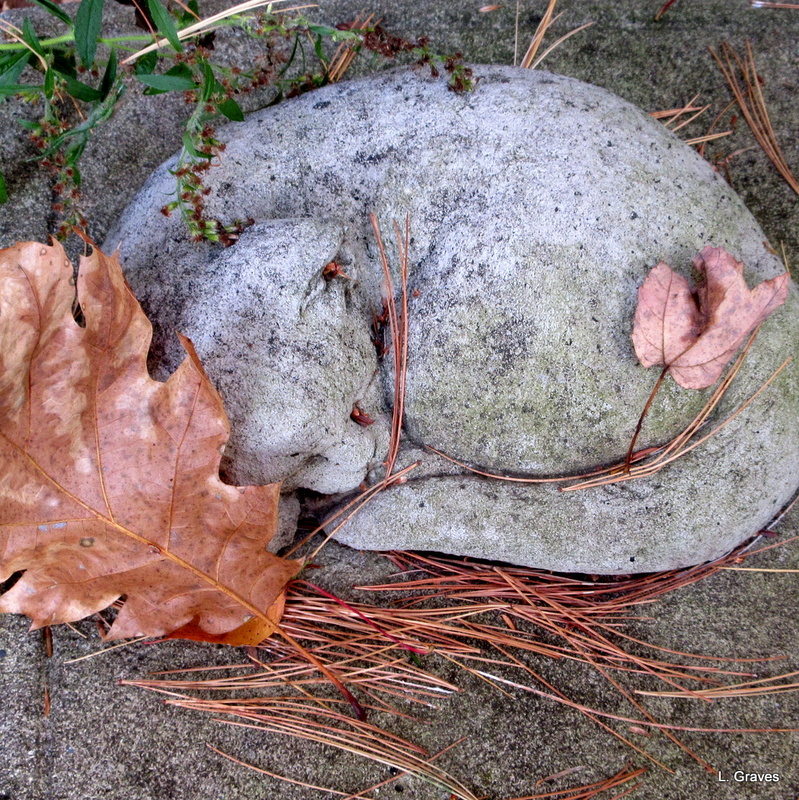 Third, the look of autumn, which spills over everything, including the memorial bench in our backyard and the little cat I bought to honor my mother, who passed away nine years ago. A final gratitude, a bonus, if you will: I am so thankful to live in an area that has four distinct seasons that each bring their own kind of beauty. As this blog surely indicates, I love the natural world for its beauty as well as its struggles. Because I live in the hinterlands, my posts often reflect this. But I also love art—books, movies, music, theater, and paintings, and today’s Three Things Thursday will illustrate how this love illuminated my life, the way it so often does. 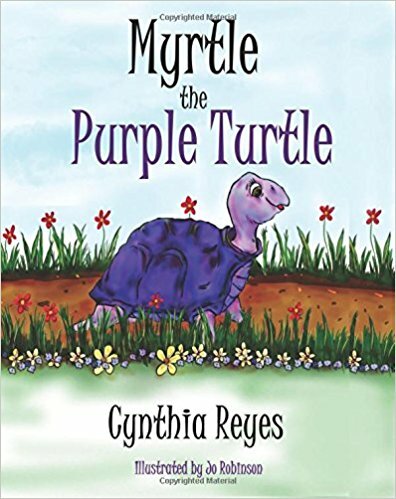 First, Myrtle the Purple Turtle a delightful new children’s picture book—released just a few days ago—by my blogging friend Cynthia Reyes. Myrtle the Purple Turtle is a gentle book that address a serious subject—not looking like most everyone around you. Race certainly comes to mind, but you could also add ethnicity, disability, or any number of things that make people feel different. In the time-honored tradition of many children’s books, Cynthia Reyes uses animals to explore this especially relevant subject. In short, Myrtle is not like most other turtles. Instead of being green, she is purple. After being bullied because of the way she looks, Myrtle takes steps to change her color, and the results aren’t exactly what she had expected. I don’t think I’m giving too much away by telling readers that the book ends on a hopeful note. Jo Robinson’s illustrations are charming but vibrant, giving warmth and personality to this lovely purple turtle. Second, the singer George Ezra and his song “Don’t Matter Now.” All during the summer, after the work of the day, my husband and I would go to the patio, have a drink, and listen to music. It was our response to all the horrendous news and decisions coming from Washington, DC. Ezra’s song somehow exactly fit our mood. Shut the door, unplug the phone. What I especially love about this is how George Ezra’s voice upended my expectations about the way he looked. And having expectations upended shakes up the mind, which is often a very good thing. 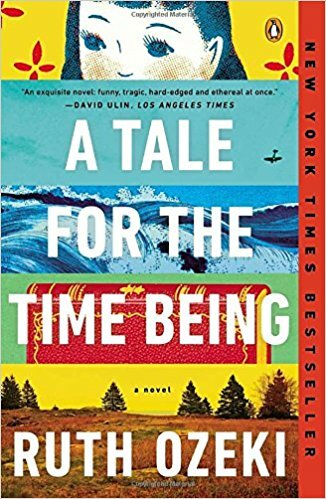 Third, A Tale for the Time Being by Ruth Ozeki. Actually, this is a double gratitude that should be shared by Title Waves, the wonderful book group I belong to, hosted by the library and facilitated by the equally wonderful Shane Billings, the Adult Services Librarian. But I digress. How to describe A Tale for the Time Being? In essence it’s a tale told in two parts. The journal of Nao, a teenager in Tokyo, is washed up on the shore of an island in the Pacific Northwest, where it is found by a woman named Ruth. The story rocks back and forth between the lonely, suicidal Nao and Ruth, who suffers from writer’s block. Throughout this quirky but often harrowing story, Ozeki explores Buddhism—Nao’s great-grandmother is a Buddhist nun and a fabulous character. She also touches on bullying, family, honor, conscience, depression, right livelihood, and memory. Finally, Ozeki examines the nature of books and readers and how they relate to quantum mechanics. Phew! That’s a lot for one book, but Ozeki pulls it off with grace and warmth, coming up with memorable characters along with some very zippy concepts. This week, with its high heat—over 90 degrees on some days—and high humidity, it has certainly felt like August. Actually, make that the end of July. 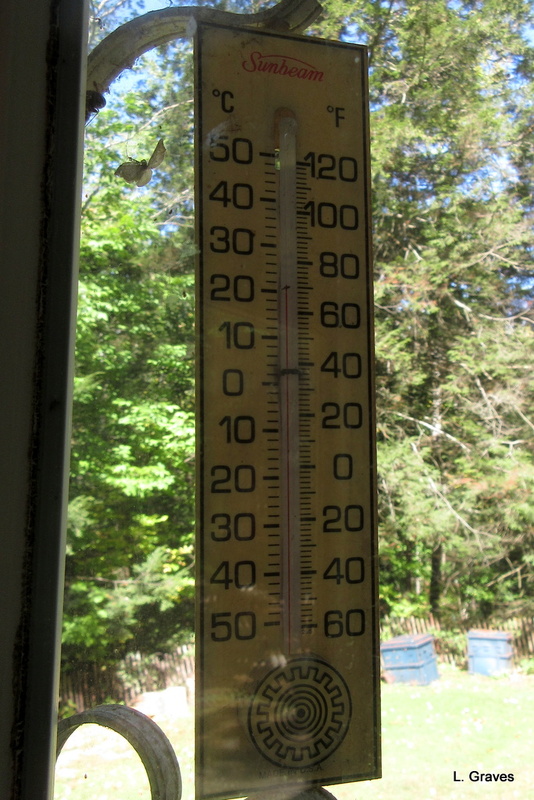 But last night, the wind came, blowing away the humidity and bringing down the heat. It is still a little warm for the end of September, but it is lovely rather than too hot. Inf fact, the temperature has gone down so much that I might have to shut the windows tonight. Second, a totally awesome fruit infusion pitcher that I found for half price at our local supermarket. As a rule, Clif and and I are very careful about stuff—new or second hand—that we bring into the house. We are mindful of the energy required to make new stuff, and our tolerance for clutter seems to be dropping precipitously as we age. However, yesterday when I saw this fruit infusion pitcher in the discount bin, I barely hesitated before snapping it up. 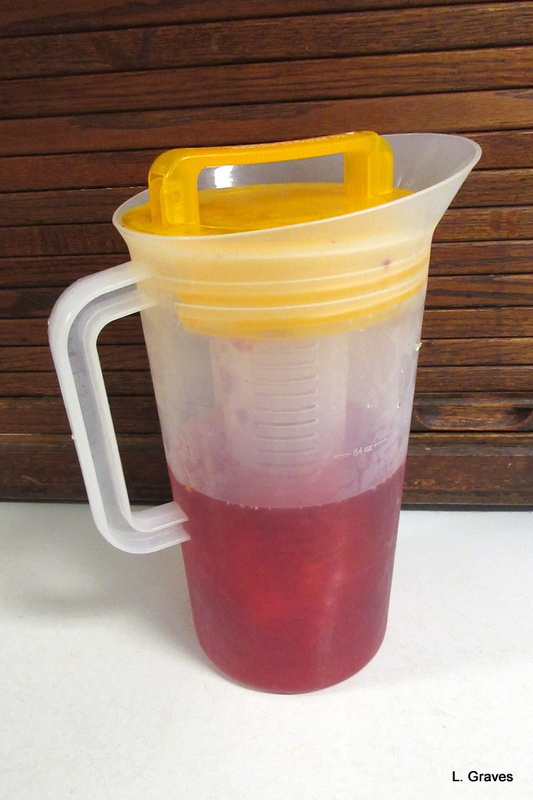 Our daughter Dee has been singing the praises of her infusion pitcher, and I am a huge fan of all things fruit or berries. Therefore, it was with great anticipation that we filled the center section with raspberries and lemons, and readers, I was not in the least disappointed. The resulting flavored water is utterly delicious, has no calories, and no artificial sweeteners. Quick as a wink, I drank two glasses of this lovely water, and if it hadn’t been so close to bedtime, I would have had another glass. The infusion mixture can be used for a couple of days, and that is what I call a lot of bang for a berry and citrus buck. Finally and perhaps best of all, Clif at 66. To celebrate his birthday, we went on a thirteen-mile bike ride on the rail trail in Augusta, and even though it was hot, we utterly enjoyed ourselves. I am so grateful to have a husband, who at sixty-six, has the energy and the enthusiasm to go on longish bike rides when it’s 85°. Bike on, Dude! Bike on. 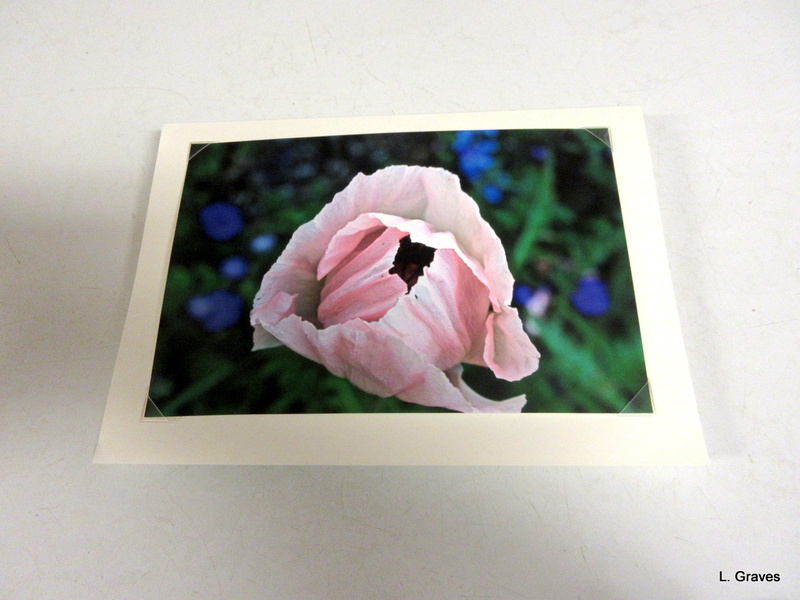 First, an early birthday card, a flower from her garden, from my blogging friend Judy of New England Garden and Thread. What an absolute treat to get this lovely card in the mail! I will be framing this flower as a lovely remembrance of my sixtieth birthday. 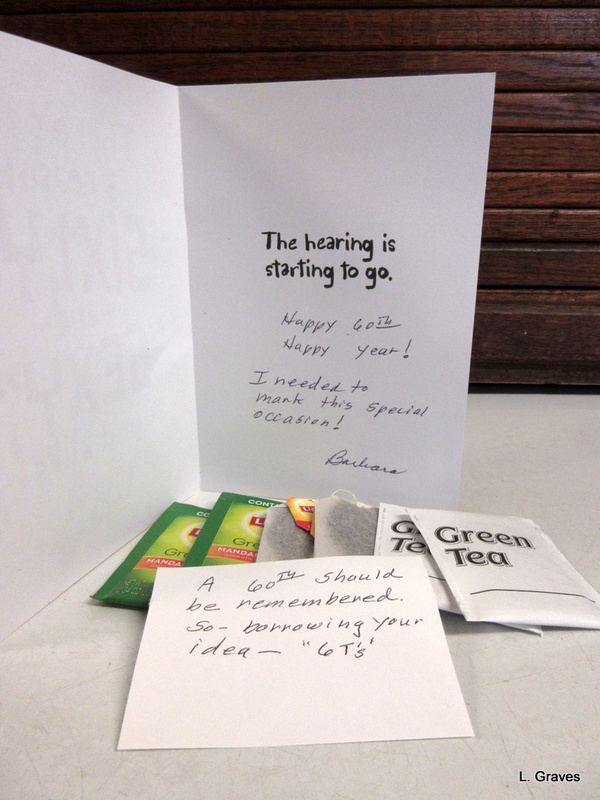 Thanks so much, Judy! 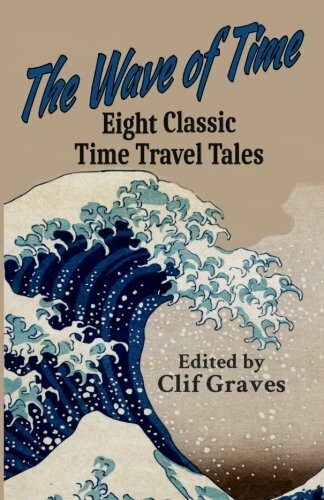 Second, The Wave of Time, my husband’s new book, an anthology of classic time travel stories by writers from the thirties, forties, and fifties. (These stories were originally published in science fiction magazines. ) Clif designed the cover, and it’s a beauty, if I do say so myself. 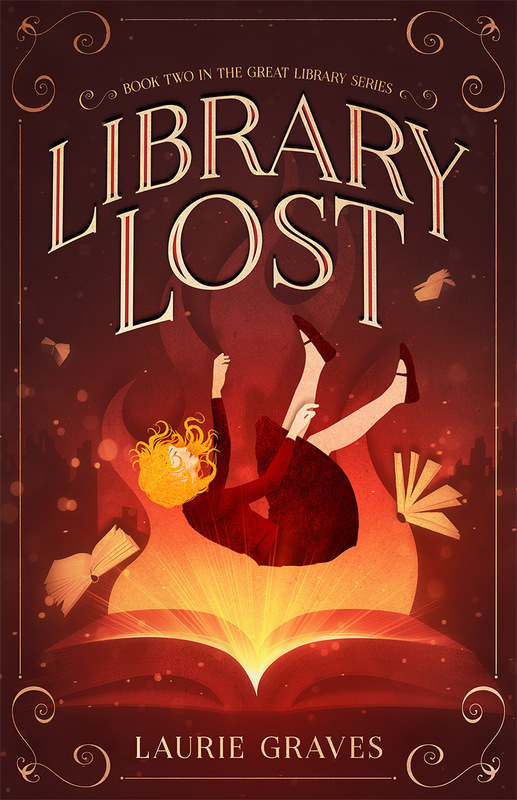 If you like time travel tales or know someone who does, then this snappy book would be just the thing to add to a collection. Third, our daughters, Dee and Shannon, are coming home for birthday celebrations—mine and Clif’s are in September, and Dee’s is in October. 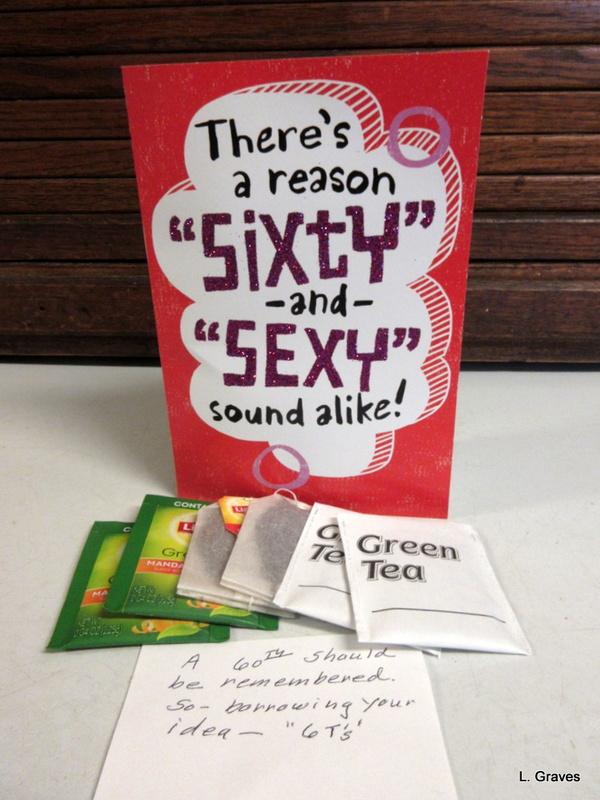 Both Dee and I will be celebrating milestone birthdays, her fortieth and my sixtieth. Clif will be sixty-six, not a milestone, but as far as I’m concerned, all birthdays are to be celebrated. Shannon is coming on Monday, September 11, and Dee will be coming September 16, and between the two of them they will be staying for two weeks. Such a treat! Really, the best present. Because my time will be spent with my daughters, I won’t be doing much blogging—I might post a picture or two—and I won’t be able to do much commenting on blogs that I follow. I do plan to read blogs each morning, but I’m guessing a quick “like” is all I’ll have time for. On Monday, September 25, I should be back in the swing of things. Until then, as Bill and Ted and Abraham Lincoln might say, “Party on, dudes!” And be excellent to each other. All right. I’m going to start with the best thing first, and the title, of course, gives it away. Yesterday, we took the long way home from our bike ride, driving in the car along country roads, listening to music, admiring the scenery. As we came to a large field bordering some gardens, I caught sight of four majestic birds flying overhead. They had long necks and long legs, and at first I thought they were great blue herons. But there was a group of them, and generally herons fly alone. And, the birds were brown. “Look!” I said, but as Clif was driving, he really couldn’t look. Then birds landed in the field, and “Stop, stop, stop!” I cried. As Louis Pasteur observed, chance only favors the prepared mind, and in the back seat, tucked in my bike helmet, was my wee wonder of a camera. Clif duly pulled over and stopped. Out I jumped and snap, snap, snap. I had never seen such birds before, but right then I really didn’t care what they were. I just wanted to get some pictures of them, and I was successful. Because of the distance, the birds aren’t as crisp as I would like, but they are recognizable. All right, readers. Verify my excitement. 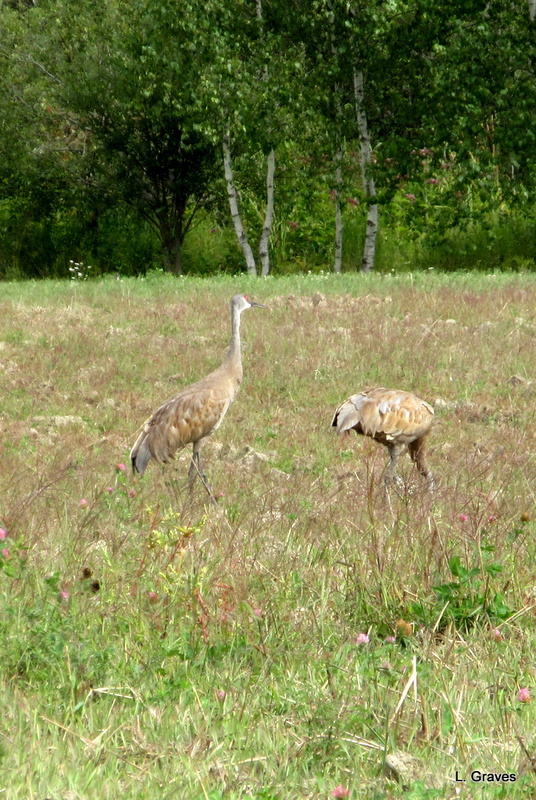 Are these sandhill cranes? If so, then joy, joy, happy, happy. I have never seen them before, and I didn’t even know they were in Maine. 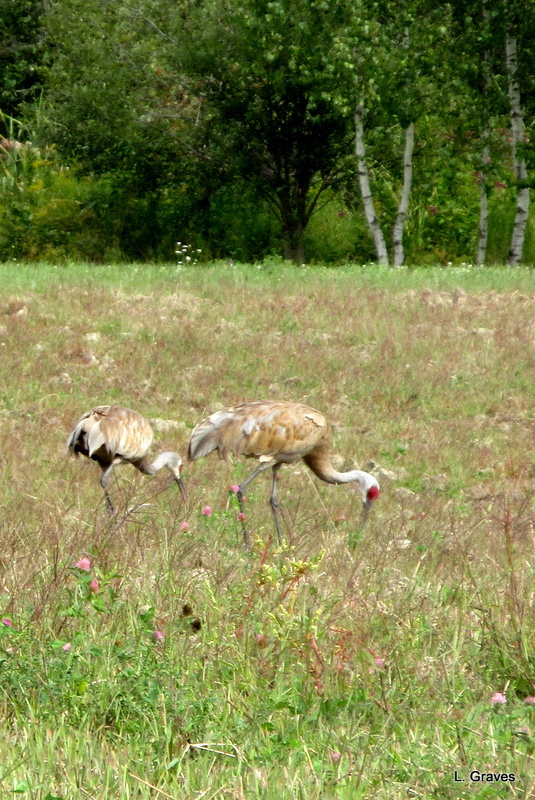 If these are not sandhill cranes, then what are they? Whatever the case, those birds certainly made me smile. Wowsah, as we Mainers would say. The next two things that made me smile are far more modest. After all, what could compete with seeing those birds? 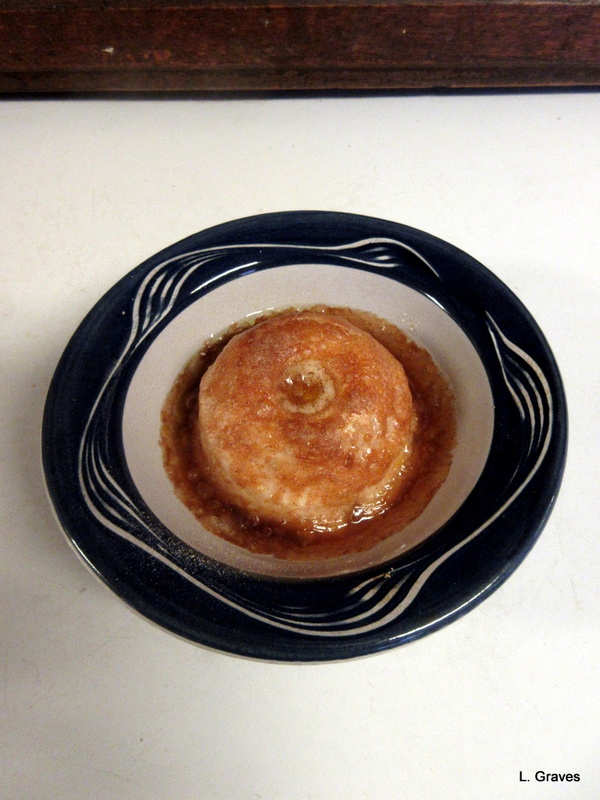 But simple pleasures are still pleasures, and here they are. 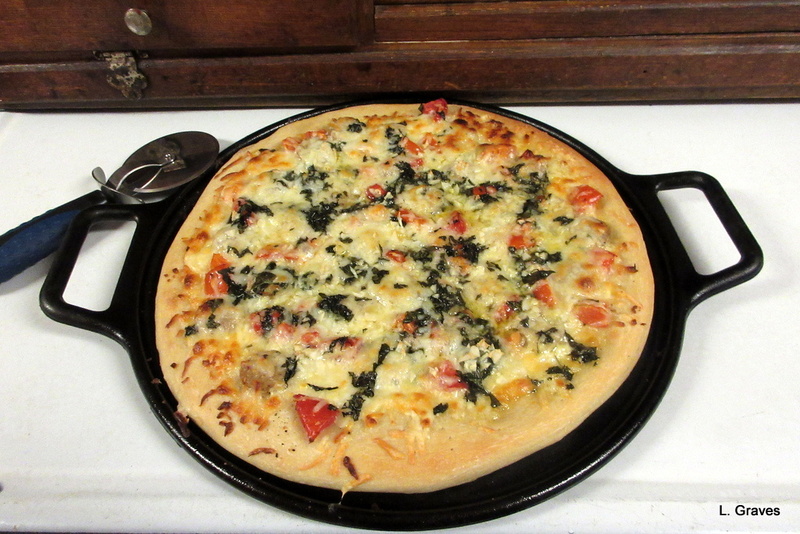 An absolutely scrummy pizza we made with Portland Pie pizza dough, available at our local supermarket; tomatoes from my garden; basil and garlic from Farmer Kev’s; Cabot’s cheddar cheese; mozzarella; chicken sausage; and olive oil. Clif put it all together, and oh my, was it good. 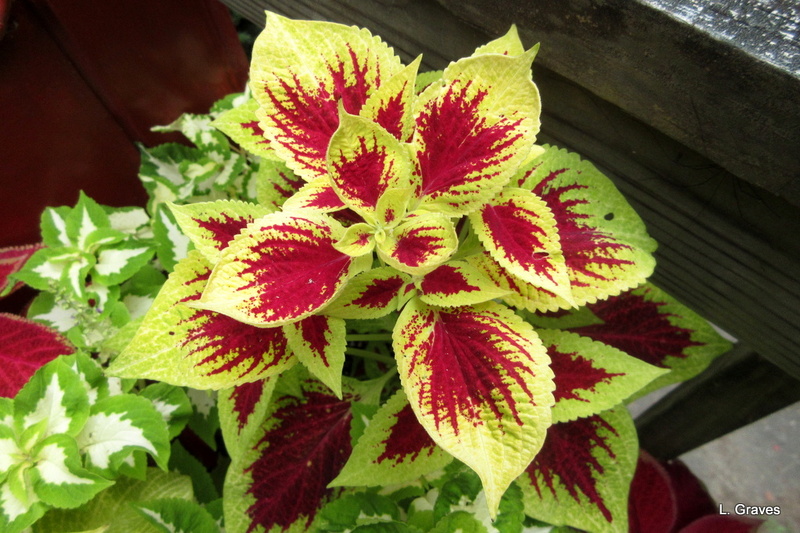 Finally, the burst of color that the coleuses provide in my shady yard. No, they are not native, but I love them anyway. Phew! What a week! I’m still agog at seeing those birds. First, little red apples. For me, there is something about apples on a tree that fills my heart with joy. Could it be because apples are one of my favorite fruit? No doubt. But I also find them very beautiful—even the small ones, which I don’t eat. I took this picture at Norcross Point, a small park in town, and these gleaming gems have the advantage of being by water. 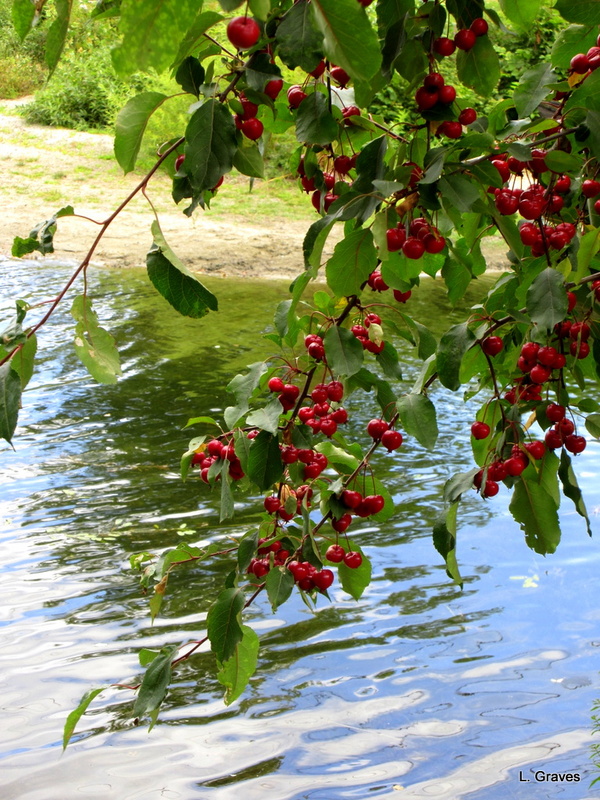 Little red apples by water. It doesn’t get much better, does it? Second, seeing Clif by the bikes. 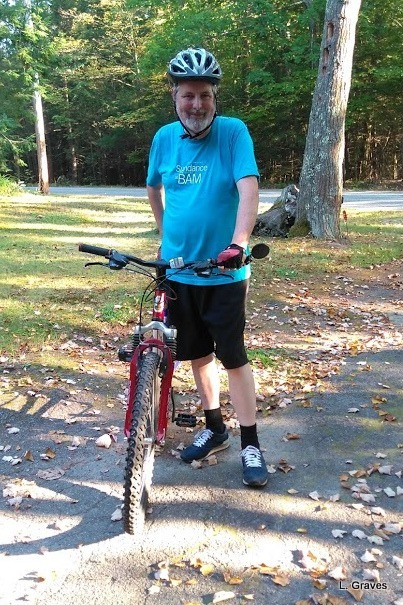 For our daily bike rides, we drive to Norcross Point right in town, where we park our car and then ride along lovely Maranacook Lake. 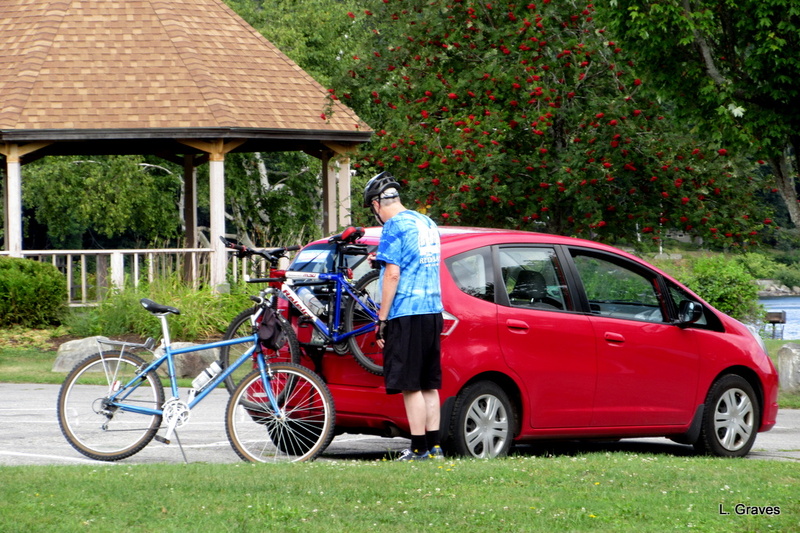 After I was done taking pictures of the apples, I walked back to the car, and there was Clif, in his bright blue shirt, by the bikes and our little red car. It was such a pleasure to see this colorful tableau. Once again, I was filled with gratitude that we have these bikes and are able to ride nearly every day. We don’t go on long rides, but we are gaining strength as the summer goes on. And by gum, my creaky knees are not as creaky as they used to be. And third, after a bike ride, what is more refreshing than ice cream? Especially when it comes from Gifford’s, a local company that, as my Yankee husband puts it, makes pretty darned good ice cream. 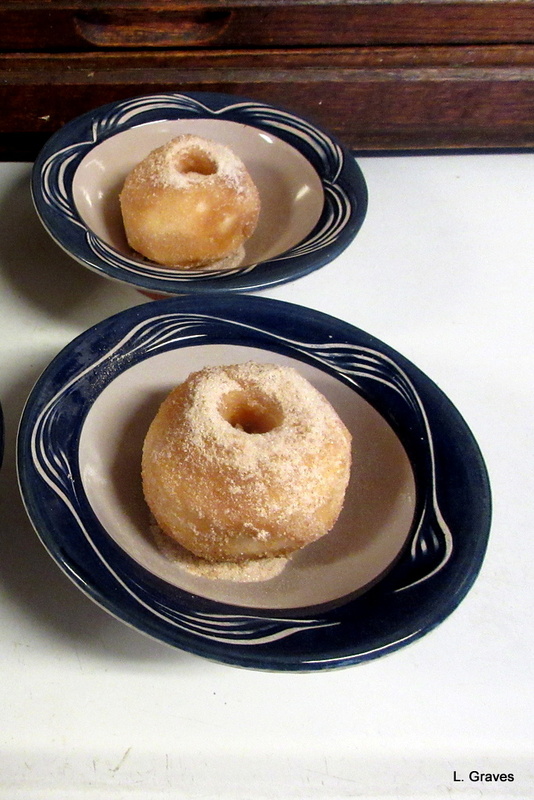 Grapenuts is an old-fashioned flavor made from that crunchy cereal once favored by the famous naturalist Euell Gibbons. (He compares the flavor to wild hickory nuts, and the ice cream does indeed have a pleasant nutty taste.) 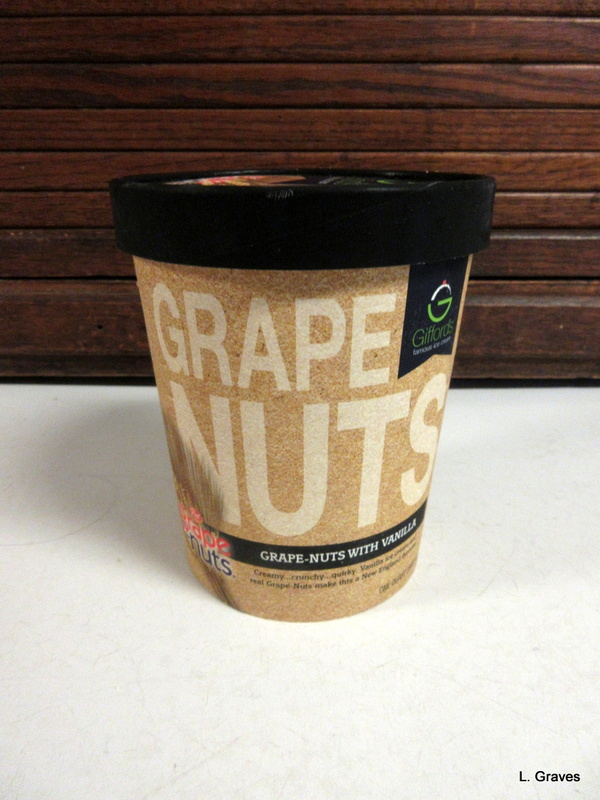 My grandmother loved Grapenuts ice cream, and back then it was only available at ice cream stands. Therefore, when we went out for ice cream, that’s what she always would get. 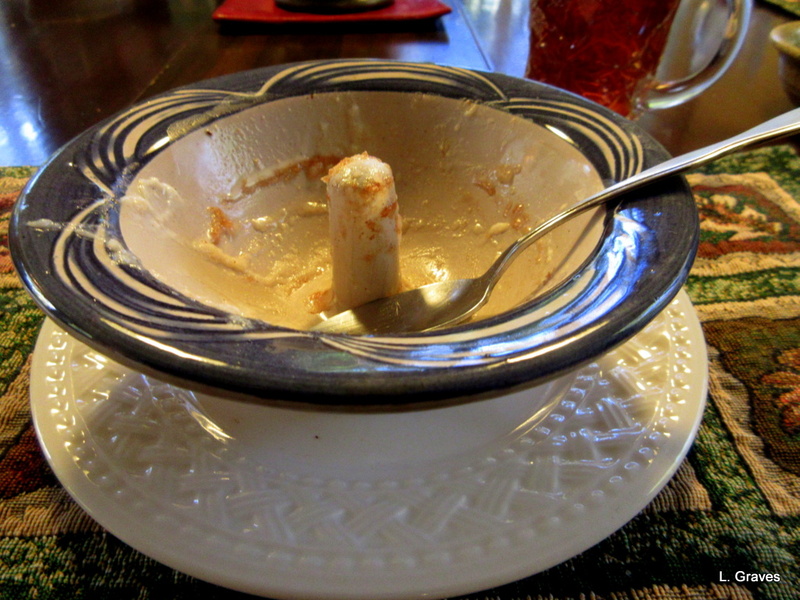 When I eat Grapenuts ice cream, I think of my grandmother. Here’s to you, Mémère.